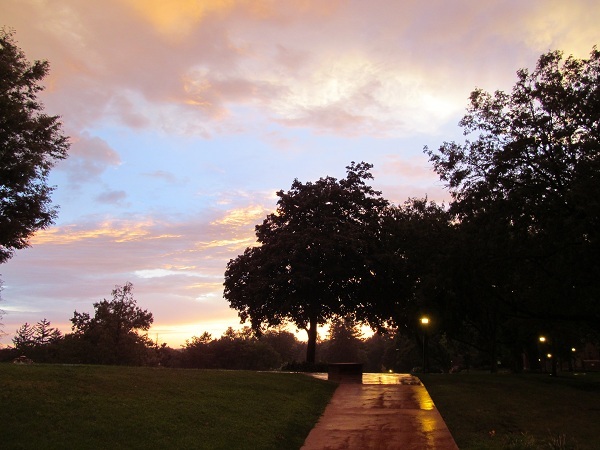 Rain at Mount Mercy University campus, around 8:15 p.m. Aug. 8–not used to seeing wet and clouds. Rain felt good–can we have more, please? I felt as if I didn’t recall what rain looked like. It fell over the weekend and I was inside, remote from it, and Saturday’s rain tumbled down so quickly that it seemed over before it started. Wednesday was different—several bouts of rain, including morning sprinkles and a pretty good downpour at sunset. I was out to observe and feel the rain both times. And when the grandchildren came over to play this morning, the leaves on the trees were all wet, and when the breeze stirred them, drops of water came tumbling down. It was not. Dry Creek is almost again dry, despite what The Weather Channel says was 0.89 inches of rain yesterday. The ground just soaked it up, and the top layer of ground is already looking a bit dry. It’s amazing what a drought will do. Anyway, at least most bushes and trees look happier today. We have a break from extreme heat, and some moisture in the ground. We also had a chance of rain today, although the sun is shining this afternoon. I hope some moisture from the sky yet finds us, as we can sure use the rain. Agriculture Secretary Tom Vilsack set off a minor fuss when he said he is praying for rain—but other than prayer, what is a federal official to do? Fight climate change, I suppose. Anyway, as long as we’re praying, a pause to say thanks for the rain that has fallen this week. It’s been the wettest week in Cedar Rapids since, well, sometime in May, I suppose. Two rainy days in under seven days. Dare I hope for more? Might I offer up a prayer this afternoon? Rain, rain, come today, gladly I would forfeit play. Amen.